Larch Hanson – The Seaweed Man! Through seaweeds, the earth’s sea-blood strengthens our own sea-blood that we carry within us. 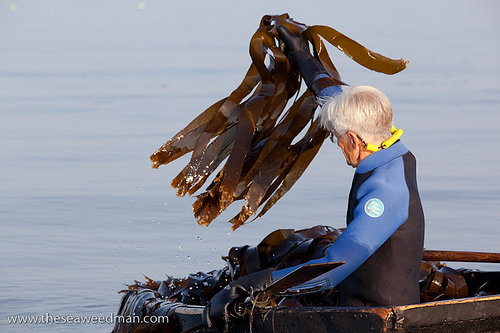 Seaweeds are an excellent source of trace minerals in our diet. As our air and water become more acidified through pollution, minerals are leached and depleted from our land fields, and they wash down to the sea, where the wild seaweeds incorporate them. When we eat seaweeds, we take these minerals back into our bodies, and these minerals help us maintain an alkaline condition in our bloodstream, which is a healthy condition, resistant to fatigue and stress. Seaweeds have admirable qualities: they are flexible, they are tenacious, they are prolific, and they are the oldest family of plants on earth. These plants link us to the primitive vitality of the sea. They strengthen our own primitive glandular system and nervous system. An average family of seaweed eaters will consume a Family Pack within six months to a year. That’s 3 pounds dry weight = 30 pounds wet weight = one bushel of wet plants. This is a very concentrated food. Don’t fear salt. Salt is necessary to life. If you are willing to sweat, you can move salt through you, and in the process, you will be actively creating your life and your dream from the universe-intelligent structures of the complex salts and trace elements that are available in seaweeds. Your body is an antenna, and your body can’t receive and comprehend the whole message from Universe unless it contains all the trace elements of the Universe. Quality counts more than quantity. If you eat the more complex salts of seaweeds, you will have less craving for simple junk food salt, and you will find yourself becoming more whole, satisfied and healthy.